You are using an outdated version of MWS Reader! Update now for free. MWS Reader 5 can read text aloud from any application using the ComfortRead function. Simply select the text in any application. Click on the ComfortRead icon near the selection. The text will be read out loud. Windows 10, 8, Vista, XP and SAPI 5, SAPI 4, Microsoft Speech Platform support. Optional automatically reading of text when copying to the clipboard (Shortcut: [CTRL] + [C]). I must say what a brilliant tool the MWS Reader is. As an author, I have used this to catch many of my typos or awkward sentence constructions. After you've worked on a novel for a while, you can be almost blind to your own errors and omissions. But when you hear a passage of text read out, you don't miss them at all. Missing words, wrongly spelled words, unclear writing - all so easy to identify. A truly handy tool which is now helping me get my novels to market faster. Bravo! I love the clean interface and its simplicity of use - VERY NICE!! My favorite function is the ComfortRead, it so convenient to have it appear close to the mouse pointer. All in all it's awesome!!! P.S. 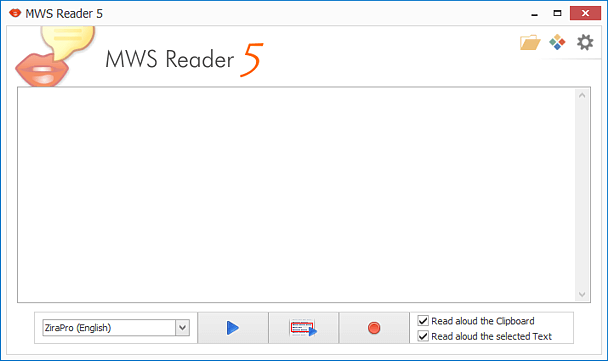 I absolutely LOVE MWS Reader 5, it is by far my most useful app.